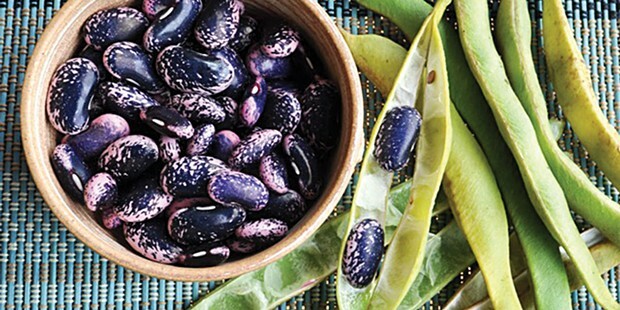 Keeping it simple with scarlet runner beans. Some plants have a lot going for them. Take, for example, scarlet runner beans (Phaseolus coccineus). Their clusters of bright scarlet flowers are quite ornamental, the pods can be consumed as snap beans when young or they can be allowed to mature for fresh shell or dry beans. True, the green pods are not particularly eye-catching, but if you refrain from judging beans by the look of their pods, you'll be rewarded with the appearance of large, striking pink and purple speckled beans. Fresh beans always get my attention, no matter the color. A basket of them drew me to Humboldt Gardens' stall at the Arcata farmers market (it's also regularly at the McKinleyville farmers market). There I met Maura Rasmussen. I asked her what her favorite way of preparing the fresh beans was and she told me she cooked them in broth and finished them with garlic and fresh herbs — a selection of which she also sells at the market. I admitted I had never cooked beans in broth and promptly remedied the situation drawing from my stash of frozen homemade chicken broth. 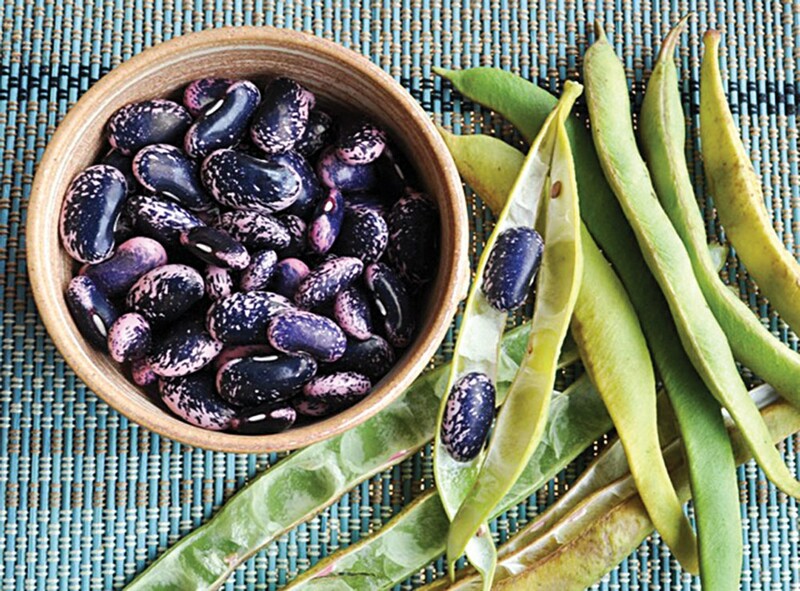 The following recipe for Herbed Scarlet Runner Beans is minimalist in a way that resonates with me: I like simple dishes that highlight the flavor of fresh ingredients. 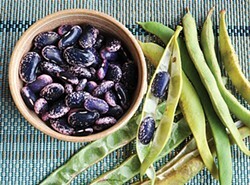 Beans are great because they can be dried, stored for a long time and cooked in myriad ways. Fresh beans are a special treat and if you have never tasted them, I recommend you try. I was hoping someone would contribute dessert to my growing collection of farmers' favorites, and Amy Neukom of Willow Creek's Neukom Family Farm, found at both Arcata and Henderson Center farmers markets, answered my wish. Summer in Willow Creek is hot and work keeps everybody quite busy, so dishes that make use of the farm's bounty without much additional work — as in, no cooking required — are favored. With eight varieties of melons growing on their farm, Amy and Jacques Neukom have an easy time bringing dessert to the table: Half a small melon, the seeds scooped out, becomes an edible bowl to fill with ice cream. Cantaloupe and Swan Lake are the varieties of choice. The Neukom family's favorite combination is cantaloupe with Honey Lavender Vanilla ice cream from Arcata Scoop. Try different combinations and find out yours. My rendition of Maura Rasmussen's recipe serves 2-3. Pour the broth in a saucepan, then add the beans and the bay leaf. If the broth is lightly salted, add 1/8 teaspoon of fine sea salt; if it is unsalted, add 1/4 teaspoon. Cover the pan and quickly bring the broth to a lively boil, then turn down the heat and let the beans simmer until tender, stirring them every now and then. Taste them after 30 minutes and estimate how much longer they need to cook. A couple of minutes before the beans are done, add the garlic to the pan and stir. When done, add the herbs and stir. Taste the beans and correct the salt as needed. Serve the beans warm with as much or as little of the broth as you like.